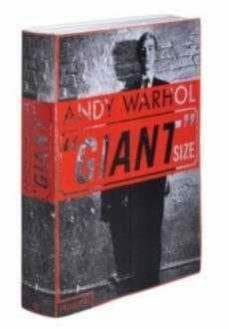 Andy Warhol Giant Size is a massive, spectacular, visual biography of the life and career of Andy Warhol. Measuring 420 x 320mm (16 1/2 x 12 5/8 in. ), with 624 pages, this huge book is a chronology of Warhol?s life, from the cradle to the grave, using photos and artefacts from the depths of the Warhol Archive and the Warhol Foundation as well as material from private sources. With rare or unseen pictures of the New York glitterati over three decades along with receipts, letters, documents, family snaps, press cuttings...there is no better insight to the man beneath the wig. Giant is the ultimate over-the-top scrap book on one of the biggest characters in 20th century art. Beginning with the registration of Andrew Warhola?s birth on 8-6-28 in Pittsburgh, the book is packed with the treasured possessions and ephemera of an obsessive hoarder. Phaidon was granted unprecedented access to public and private archives and collections, including the Andy Warhol Foundation and the Andy Warhol Museum as well as the holdings of Warhol collaborators, personal friends, and photographers of the period. The book includes a staggering quantity and array of material including: childhood photographs of Warhol and his family; the magazine tear sheet showing the first article he illustrated for Glamour magazine when he arrived in New York in 1949; drawings of gold shoes he created in the 1950s; a letter from The Museum of Modern Art dated 1959 in which the Director of the Museum?s Collections rejects an artwork Warhol offered them as a gift; photographs of Warhol posing with Edie Sedgwick in a New York fashion shoot; photographs of Warhol creating his famous silk screen prints in his studio; personal letters from Mick Jagger and Liz Taylor to Warhol; covers of Interview and pictures of Warhol in the office working on the magazine; pictures of Warhol private views; a series of shots of Warhol experimenting with make-up and wigs; ending with the order of service for his Memorial Mass on 1 April, 1987 and his gravestone. Estupenda edici&amp;oacute;n la de esta obra sobre el mundo Warhol, con fotograf&amp;iacute;as y documentos de gran valor art&amp;iacute;stico y documental.